Nearly opposite MM. Halphen's "Star of the South"—the great diamond that, in this Exhibition, is put forth to rival the Koh-i-noor—is a Nave stall glistening with splendid specimens of French glass manufactures. The most prominent contributions to this stall are the two great green and white candelabra sent by the Compagnie des Cristalleries des Baccarat. 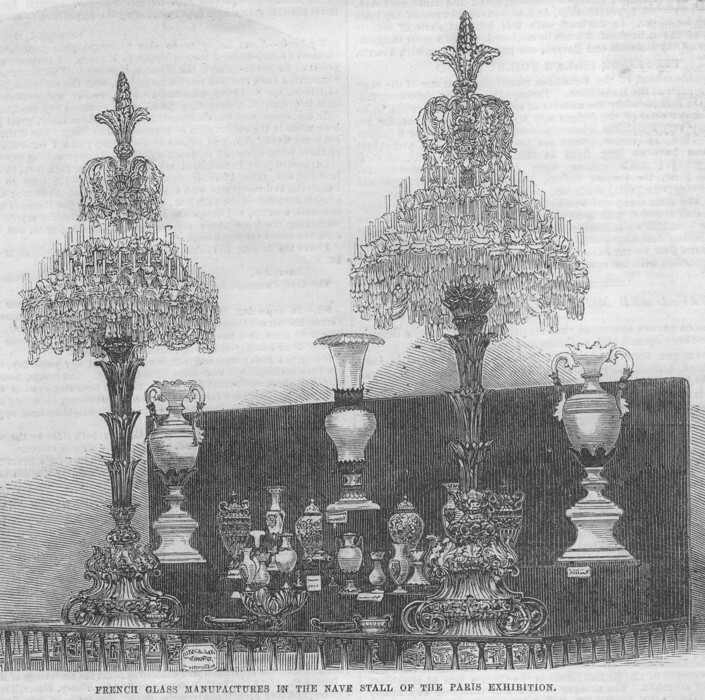 These immense piles of solid glass are continually compared with the great candelabrum by Osler, exhibited near the St. Gobain glass. The French are said to have more effect; but the English glass is allowed on all hands to be purer in colour. The balustrade of this stall is of malachite crystal. Grouped near the candelabra are some beautiful tazzas from the Compagnies des Cristalleries of St. Louis, Moselle, and some vases from the Cristallerie de Clichy. This stall marks the entrances to the French Glass Manufacture Court. This court includes nearly all the artistic glass-work contributed by France to the Exhibition. The collection includes some beautiful ruby glass from the Cristallerie de la Villette; engravings upon glass by Becker; and a huge lion, with a serpent coiled about him, spun in glass by R. Lambourg, of Saumur (Maine-et-Loire). This immense labour was specially remarked by Prince Albert. Near it are some delicate artificial glass flowers, by the same expert contributor The court includes, in addition to these curiosities, and the beautiful goblets from Baron de Klinglin and Co., &c., the delicate little articles in glass blown by J. Em. 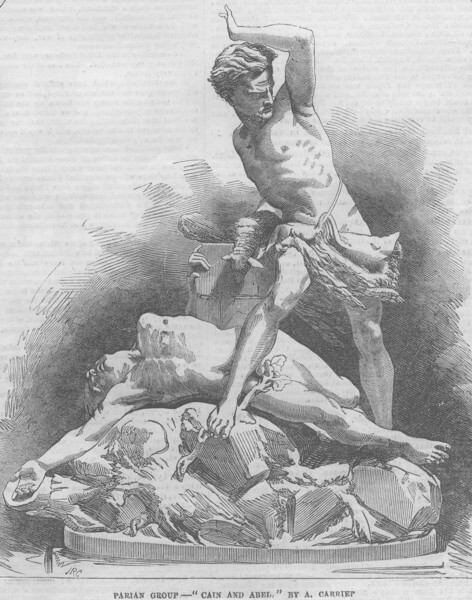 Pilon, of Clichy-la-Garenne, a deaf and dumb workman, who never served an apprenticeship, and who invented some of the tools with which he works. In contrast with this brilliant show of artistic glass manufactures, England, it must be confessed, makes a most insignifcant figure. Only Bohemia and Bavaria can presume to cope with France.